By drbubb, May 25, 2016 in Campaign 2016 threads: "Discernment"
"Trump does not like compromise on core values"
Sen. Joni Ernst in the running to be Trump's VP? Alex presses roger Stone on who is on Trump's short list and discovers powerful info. Primary voters go to the polls on Tuesday, June 7, in California, Montana, New Jersey, New Mexico, North Dakota and South Dakota to select presidential candidates and much more. This post will be updated throughout the day with news, analysis, exit polls and results. If you play Little League you get a trophy, even if your team doesn't win a single game. And if you vote, you get an "I voted" sticker, even if you check the box for a reality-TV star. That's the way it works. When progressives aren't talking about the Hail Mary pass that could win the Democratic presidential nomination for Bernie Sanders (see below), they're talking about who they want as vice president on the Democratic ticket. It's not Sanders: His fans only want him at the top of the ticket. Bernie or Bust, remember? The answer to the veep question is Elizabeth Warren, the U.S. senator from Massachusetts who was the progressive wing's favorite until she refused entreaties to run against Hillary Clinton and Sanders stepped in to fill the void. Just a month ago, Democratic Senate Minority Leader Harry Reid said he would oppose any sitting senator being chosen for VP who was from a state with a Republican governor. A state's governor typically chooses the interim replacement when a senator leaves mid-term. "If we have a Republican governor in any of those states the answer is not only no, but hell no," Reid said last month. But now Reid -- and Clinton and the rest of the Democratic establishment -- apparently is suddenly warming to a Hillary-Liz ticket. "He thinks Warren is a good choice to unify the party," a source "close to Reid" told Politico. But Warren's appeal to Sanders' voters might not be the only reason she might end up as Clinton's second banana. Vox's Dylan Matthews argues that "the real reason Warren is dominating the conversation is simple: The rest of Clinton's options are very, very weak." Matthews has a point: the bench for the Democratic national team is surprisingly shallow this year. Matthews says HUD Secretary Julian Castro, who is frequently mentioned in discussions of potential vice-presidential candidates, is "laughably unqualified." He also points out that Tim Kaine, the senator from Virginia, "has a strong anti-abortion record that wouldn't be a great addition to the first woman-headed major-party ticket in American history." Another person who's often mentioned, Labor Secretary Tom Perez, is surely too unknown and uncharismatic to make the final cut. And that leaves ... Ohio Sen. Sherrod Brown? Too blah, goes conventional thinking. New Jersey Sen. Cory Booker? Might make Clinton look too blah. Colorado Gov. John Hickenlooper? Too goofy. New York Gov. Andrew Cuomo? Too New York. (Clinton, after all, is from the Empire State -- and so is Donald Trump.) Pennsylvania Gov. Tom Wolf? Too easily confused with the famous author. New Hampshire Gov. Maggie Hassan? Too ... who? Sounds like we might wind up with Warren heading the Dem ticket after all. Flynn, a registered Democrat but fierce critic of President Obama, previously ran the Defense ... One person encouraging Trump to perhaps choose a general is Sen. In a special web extra, General Michael Flynn, former head of the US Defense Intelligence Agency (DIA) under President Obama, discusses his informal role as an adviser to presumptive Republican presidential nominee Donald Trump. is a retired United States Army lieutenant general who served as the director of the Defense Intelligence Agency, commander of the Joint Functional Component Command for Intelligence, Surveillance and Reconnaissance, and chair of the Military Intelligence Board from July 24, 2012, to August 2, 2014. Prior to this he served as assistant director of national intelligence. He consistently pushed for greater information and intelligence sharing and was a leading figure in coalition and special operations intelligence operations. Flynn co-authored a report in January 2010 through the Center for a New American Security entitled Fixing Intel: A Blueprint for Making Intelligence Relevant in Afghanistan, which criticized the intelligence community for lacking an understanding of the human-socio context of the battlefield in Afghanistan. Flynn's military career was primarily operational, with numerous combat arms, conventional and special operations senior intelligence assignments. He also served as the senior intelligence officer for the Joint Special Operations Command, where he was credited with creating innovative techniques for interrogation operations and operations-intelligence fusion, leading to major breakthroughs in counterterrorism operations in Iraq, Afghanistan and elsewhere against Al-Qaeda and its associated movements. Flynn is a published author, with articles appearing in Small Wars Journal, Military Review, Joint Forces Quarterly, the Center for a New American Security, and other military and intelligence publications. In May 2016 he emerged as one of several leading possible choices as vice presidential running mate for Republican nominee Donald Trump. Flynn is a registered Democrat, having grown up in a "very strong Democratic family." On abortion, Flynn is pro-choice, stating "women have to be able to choose." http://www.powerofprophecy.com/ The Republican Party’s presidential nominee, Donald Trump, has made his short-list of vice presidential choices. The news is out that former Speaker of the House Newt Gingrich is top on the list. This is great news for billionaire Jewish money-men, but it is very sad news for patriotic Americans. Will it be this week? Is there a Time Deadline? Buzz is building on Capitol Hill for Indiana Gov. Mike Pence to be Donald Trump’s running mate. Republican lawmakers, some of whom have close ties with Pence from the more than a decade he spent in the House, say the battleground state governor could be instrumental in helping Trump develop the relationships he needs in Washington. GOP House members praised Pence, 57, as a proven fundraiser and principled social conservative they could work with to influence Trump in the Oval Office. Former colleagues say Pence, who started his career as a conservative radio talk show host in Indiana, is as skilled a communicator as the party has. They gushed about how he could help unite establishment Republicans and grassroots conservatives behind Trump, who has otherwise struggled to bring together a fractured party. Pence, who is seeking reelection to a second term as governor, would have to withdraw from that contest by noon next Friday, July 15, if he’s going to run as Trump’s vice president. The name. imho. begins with the letter P.
"Everything that Hillary is doing to suppress Trump in the shortrun has NO MEANING in the long term." "She is spending $23 million a month, and he is spending nothing." "She is running expensive ads because she is afraid to talk to the press and answer their questions"
"Trump is easily available to the press, and they like to write about him and comment on him"
"There's a worldwide revolution, against the establishment, and Bernie and Trump are part of that"
"But Bernie was about accelerating the changes made by the elites while Trump is about reversing them." Do you think the announcement of Hillary's VP will be disrupted like this? He talks about rebuilding the military...how about rebuilding the Middle east first... let Russia finish off Isis and then take their nose out of where it doesn't belong but oh no they have to promise the MIC something otherwise the money train stops. Same old song ...different singers. "There's something very honest about someone who says, I am the boring candidate"
And yet, Hillary Clinton’s choice of Tim Kaine as her running mate, which she announced by texting supporters tonight, has gotten some people very worked up. Unfortunately for the Clinton-Kaine ticket, not in a good way. 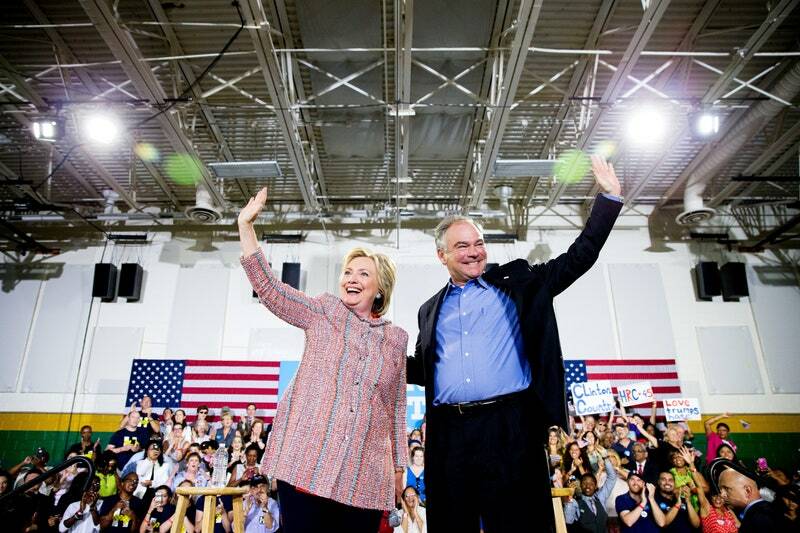 "He does nothing to help her... A boring choice"
"An inside the beltway ticket"
Kaine : An insider on the take ?